How do you say Shazaaam! in the interior decorating world? 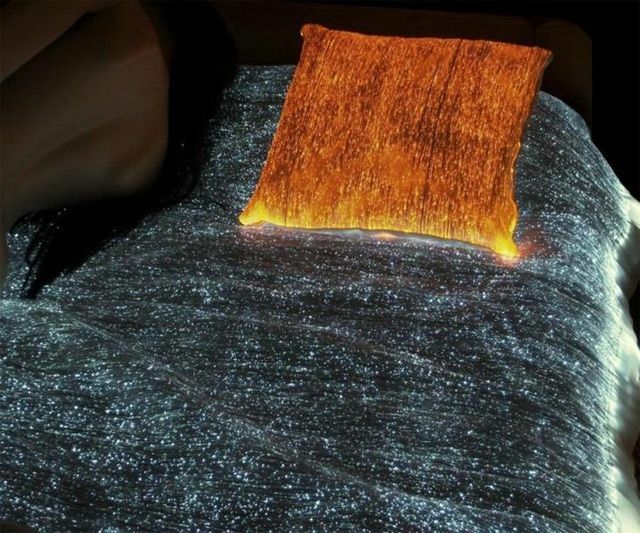 I bet my mama wouldn't get so mad at my dad for wanting to put the electric blanket on the bed starting around September 15th every year if their electric blanket were powered by fiber optics that also made it emit enticing, mysterious, luminous colors from each of its fibers. Fabricated from a Luminex patented material, the Luminous bedspread harnesses the more subtle, glittering-in-the-shadows effects of fiber optics, instead of going for more blaring lighting techniques, such as those set forth by neon, LEDs, and electroluminescence. Because the Luminous bedspread is powered either by low-voltage batteries or by a mains adaptor (4.5V), it won't heat up and poses no safety threat in terms of electrical shock. However, we can't guarantee that men who have a fiber optics bedspread will not sustain injury from the throngs of women clamoring to spend a night beneath it. Luminex's fiber optics bedding comes standard in Full/Queen and King sizes, though special orders for smaller, Robert Downey Jr., or larger, Chris Hemsworth sizes can be custom-made upon request. Available fabric colors include blue, gold, black, pink, red, green, white, orange, light beige, and light silver. Glow colors come in blue, red, green, and white. Buyers have their choice of color combination. 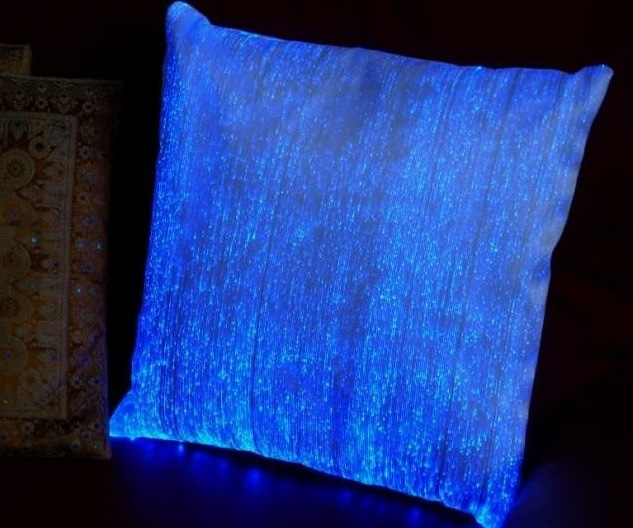 The company also makes an assortment of additional fiber optics home decor, clothing, and accessories. For a less expensive, but still pretty darn expensive, alternative, check out their Luminous pillow or tablecloth (both $194).